The best parts of John Cameron Mitchell's films have a barely-contained energy, turning relatable emotion into cinematic (and often musical) expression in movies like the masterful “Hedwig and the Angry Inch” and often-fascinating “Shortbus.” When he delivered the more dramatically sincere heartbreak of “Rabbit Hole,” he proved how deft he was at handling trauma and directing performers (it remains one of Nicole Kidman’s best performances). It’s taken eight years for his fourth film to hit theaters, a full year after it premiered to very mixed reviews at Cannes, and this adaptation of Neil Gaiman’s short story feels like it shares some of the best elements of Mitchell’s previous work. There’s the punk rock expression of “Hedwig,” the sexual exploration of “Shortbus” and even some family drama that recalls “Rabbit.” And yet these elements slip through Mitchell’s fingers in the second half, as the various themes and subplots of “How to Talk to Girls at Parties” sort of just smash into each other instead of coalescing into something satisfying. 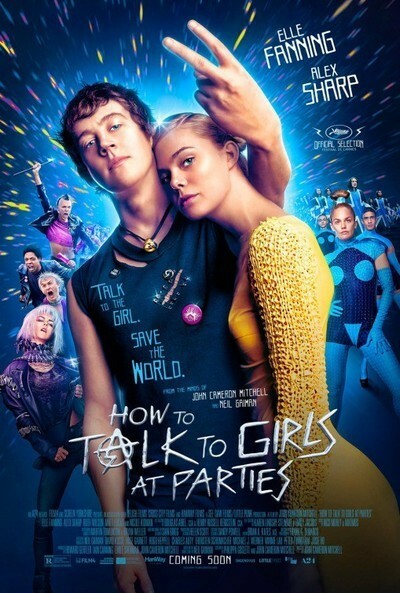 Ultimately, “How to Talk to Girls at Parties” is like a hyperactive kid at a punk rock show—full of great energy and ambition, but not too sure what to do with it. The dramatic conceit of “Parties” is a clever one, contrasting punk youth culture in ‘80s England with, well, an alien race built around conformity, one that literally eats its children to sustain itself. One such child is the wide-eyed Zan (a perfectly-cast Elle Fanning), who meets punk kid Enn (Alex Sharp) one night after the latter gets lost looking for a punk show after party. With his equally punk buddies, they stumble into what is basically the Airbnb for a bunch of aliens on holiday. Zan is instantly fascinated by Enn, and a star-crossed Romeo and Juliet starts to play out. Given 48 hours of freedom to explore the city with Enn, Zan realizes the power of youth rebellion, and meets the Queen of the local punk movement, played by Nicole Kidman. “Do more punk to me,” she tells Enn. Enn’s two buddies—one is sexually awakened by another race of aliens led by Ruth Wilson while the other becomes obsessed with the impact the music the aliens play has on him—are distracting more than entertaining, a quality Pere Ubu joke not withstanding. And then the final act kicks in and “How to Talk to Girls at Parties” totally gets away from Mitchell. It becomes an alternately talky and crazy movie that comes apart at the seams tonally. Most shockingly, it actually leaves Enn and Zan for long stretches. As much as I love Kidman and Wilson, this is the kind of movie that demands a forced perspective on the two kids at its center. Without them, it’s clearer how silly the whole thing is and harder to stick with it. Viewers will put up with the pursuit of young love more than the dissection of interstellar rituals.